Frequently asked questions — How do I install Joomla? Joomla is a free, open-source CMS (Content Management System). Joomla may be downloaded from http://www.joomla.org/download.html/. The file you download from Joomla is a zipped archive, which needs to be unpacked before it can be uploaded to our servers. Unpack the archive to a local folder on your machine. Once unpacked, connect to your webhotel through FTP using your favorite FTP-program and upload the contents of the folder (not the folder itself) to the "www"-folder on the remote FTP-server. See the following FAQ-point for more information about uploading files: How do I upload files to my webhotel? When the Joomla files have been uploaded into the www-folder, you may begin the installation by navigating your browser to www.example.com (replace example.com with your registered domain name). 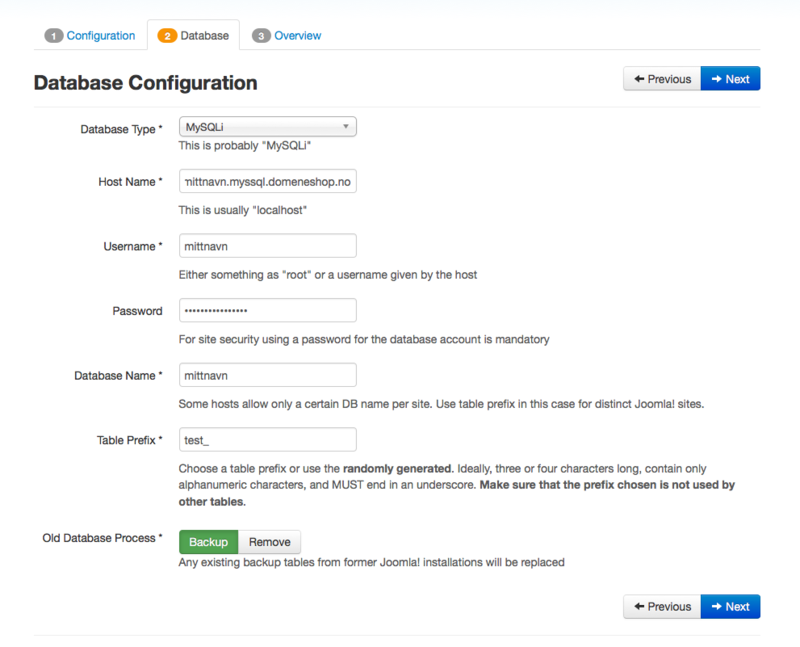 Follow the instructions given, and supply the MySQL account information for your domain when asked. Joomla will now attempt to connect to the database. If successful, you may complete the installation by typing the name of your site and a password for the administration pages. When Joomla is installed, a file named configuration.php will be created on your webhotel. This is a configuration-file that contains your MySQL-password in clear text and should not be readable for other users as it can be misused to deface or "hack" the website. In the unix shell, you can fix this by running the command chmod o-r configuration.php (The octal permission should be 640 or 600). Most FTP-software also allows changing permission of files; remove the read permission for the "other" group. Click "Extensions" in the menu and select "Extension Manager"